Poutine with Ancho Chile Gravy is my version of the unusual Canadian favourite. 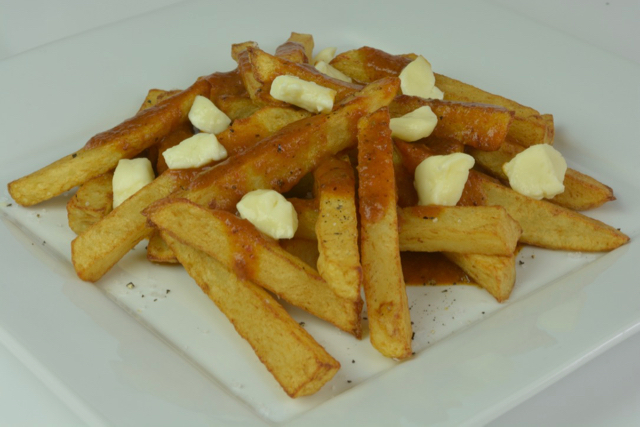 Originating in the province of Quebec, classic poutine is a bowl of French fries and gravy topped with cheese curds. The combination of flavours and textures is delightful and variations of this dish can be seen on restaurant menus across Canada. From pulled pork to lobster there is no end to the unique interpretations of poutine and there are breakfast and dessert versions too. Calgary Poutine Week is a fun food event in support of the charity, Mealshare. For an entire week in April local restaurants serve stand-out versions of poutine. For every poutine sold in participating restaurants, a simple, healthy meal goes to a youth in need through the charity partner. Best of all there are vegetarian, gluten free and vegan options. Check out Poutine With Purpose and follow #PoutineWithPurpose on social. But you don’t have to go to a restaurant to enjoy poutine. People with food restrictions know they can create their own fun food event right in their own kitchen. The night I made this poutine I also cooked chicken wings so I would have the tasty brown bits from the bottom of the pot to make my Ancho Chile Gravy. This is the same gravy I make to serve with my Thanksgiving and Christmas turkey. It has southwestern flavours from poblano and ancho chiles and is thickened with masa harina. There is a little kick but it isn’t spicy hot, perfect for poutine I thought. There will be more gravy than you need for poutine so plan to have roast chicken soon after and use up the rest of this Ancho Chile Gravy. You can certainly make poutine with any brown gravy. I might try it another time using the brown gravy from this recipe for Salisbury Steak. Instead of the Salisbury Steak I would make tiny meatballs and after all the poutine recipe names I read, I might just serve Poutine with Gravy, Cheese Curds and Meatballs. Cheese Curds have a mild cheddar-like flavour with a unique springy texture and can be white or orange in colour. Aside from using cheese curds in poutine people eat them as a snack, but they do lose their texture so should be enjoyed within a few days. The crispiest French fries are soaked in cold water to remove some of the starch which prevents them from sticking so plan accordingly. Then they should be twice fried for maximum crispiness. Just get yourself set up, cook them once and let them cool. Then when everything else is ready, do the final frying and serve them piping hot. Deep frying is a technique that takes a little practise. You probably have to make French fries a few times before you get the exact temperature and time to cook your fries perfectly. Making notes is the quickest way to remember how you did it. A mandoline slicer is the tool to make evenly cut potatoes for French fries or thin sliced potatoes for scalloped potatoes. I have a bit of a love-hate relationship with my mandoline, if you own one you might know what I mean. A good chef’s knife also works well to cut potatoes by hand. Do you deep fry at home once in awhile? If you own a deep-fryer then you’re set. I don’t. I just don’t deep-fry often enough that I ever wanted to buy one. But I do enjoy all kinds of deep fried treats so I have a great system for deep-frying in my flat-bottom wok. It’s not just the wok but also the long-handled strainer for turning and removing food from the oil, a thermometer and a few clean up tools. I have a large pyrex measuring cup that I put in the sink making it easy to pour the oil into. When the oil is completely cooled it is easy to pour back into the original container to be used again. Well, are you going to try some poutine? Let me know in the comments below if you did. Blacken poblano chiles over a gas flame or under the broiler until blackened on all sides. Place in a plastic bag and let steam for 10 minutes. Remove from bag, peel and seed chile. Cut chile into large pieces. Set aside. Blacken ancho chile in heavy skillet over high heat until the colour darkens slightly and become fragrant, about 30 seconds. Transfer ancho chile to medium bowl. Add enough boiling water to cover chiles. Let stand until softened, about 20 minutes. Remove from liquid and pull chile away from stem, cut into large pieces. Reserve ½ cup soaking liquid. Fry chicken wings or thighs in a pan so you have the fat and browned bits to make gravy. Set the pan over medium low heat and add 2 cups broth. Sprinkle masa harina over the pan juices. Whisk until mixture resembles a paste, scraping up any brown bits, about 2 minutes. Add chile puree and simmer about 5 minutes to blend flavours. Season with salt and pepper. Keep warm until ready to serve. Cut potatoes into even sized pieces for French fries and put them into cold water for 30 minutes or up to 3 hours. Drain well on a tea towel before frying. Heat oil to 350-375°F. Line tray with paper towels. Working in batches cook potatoes until pale brown, 2-3 minutes. Transfer to paper towel to drain and cool. Continue until all potatoes are cooked once. Working in batches repeat process frying until golden brown, approximately 3 minutes. Put French fries on plate, salt and pepper to taste. Pour gravy over top and sprinkle with cheese curds. Serve immediately.